With your own, private artificial grass putting green, you will be able to practice your passion 365 days per year. Relax and unwind in your own backyard, without having to drive to and from the golf course. Whichever type of green you desire, the possibilities for laying synthetic golf greens are endless. We can provide both sand-filled and non-filled systems; the difference being that you get a natural bounce when the ball is hit from a distance when the green is sand-filled. Golf synthetic turf is also suitable for all kind of leisure activities – fun for the whole family! An important advantage of Royal Putting Greens and Royal Grass fringes and lawns is the low maintenance. No need to mow, spray, fertilise. Any twigs, leaves and seeds from the plants around the garden are easily swept off. Should any weeds occur, these are easily removed by hand or kept at bay by applying an environmentally friendly weed killer. As a golfing enthusiast, you know that your short game is more important than anything else. Over half of the drives are done on and around the green. If you have your own golf green at home, you will be able to practise around the year. The only time you won’t be able to practise is when your green is snow covered. With your own, private golf court, you will be able to effectively lower your golf handicap. The Royal Grass artificial grass types have been especially developed for connected artificial lawns and surrounding fringes. Create your own private golf green – whether a putting green lawns and surrounding fringes. The greens are laid with USA polymer putting green cups. On your own golf green. The ball will behave in exactly the same way as you used to on the professional golf course. Royal Putting Greens enables natural backspin and bounce, both during putting and approaching. We herewith like to explain you more about our synthetic putting turf. The Royal Putting Green product is manufactured in the Netherlands with a special Polyamide yarn (Nylon). The fibres (yarns)) are manufactured in Germany by the renowned company Schramm. Tufting process is done in the Netherlands on the machines of Belakos, which is the largest tufting company in the Netherlands. The other components; latex, under carpet, glass fibre are all Dutch made and incorporated in the production process. When the tufting process is done and the yarns are cut in the carpet on the exact length, the turf goes to the backing street (150 meters) where the latex will fixate the tufts in the turf. In order to dry the latex and to bring the fibre in the correct curl it needs to go through the oven. In this special oven there is temperature from the top, as well as from the bottom in order to bring the yarns in the correct curl. Once the turf comes out of the oven all fibres are curled nicely and fixed, however the exact speed of the green is not yet achieved. We produce 3 different types of advanced turf, ie. Eagle, Birdie and Albatross. This combination creates a higher of lower density and because of this a different ball speed.The exact speed of the carpet will only appear when the turf is used and played on for a short period of time. Then the density and yarns are structured in such a way that the speed is reached, with a slight variation between dry weather and wet / moist weather circumstances. Similar to a tooth brush (Also nylon). When the toothbrush gets wet, the fibres gets softer and when it dries out, it the fibres are harder. For each production run the nylon fibres are separately manufactured. It is never possible to combine the yarns from different production runs, because there will be ALWAYS be a colour difference. Especially Polyamide yarns are very sensitive to colour differences. Therefore we never use rolls from two different production rolls within 1 installation. The reason for us to use Polyamide yarns is because of the stability. Other fibres like Polyethylene or Polypropylene are much weaker and do not have a “memory function”. Because of this these fibres will flatten down very quickly and will never come up. The ”memory function” of Polyamide (Nylon) enables the carpet to keep the speed stable without fluctuations. This provides the user always the same speed of the green, independent on the amount of traffic. When the turf is newly installed the ball could be a little “Skippy” which is caused by the fact that not all yarns are already in the right position when it comes from the oven. Intensive use will improve the ball roll within a short period of time. Maintenance is still very important for the advanced carpet…. This comes mainly down to brushing manually or a power brush. This brushing removes all organic matter out of the turf. Too much organic matter (Leaves, sand, etc) creates weeds and fixates the fibres, which influences the speed of the green. Other than that brushing helps the maintain the upright stance of the fibres. We hope to have explained your more about the technical details of our Polyamide (Nylon) greens and in case you may have additional questions, please feel free to contact us. The designers of Royal Grass took their cue from nature. The design of the grass fibres mimics not just the colours, but also the shape and structure of natural grass. A robust core, the “backbone” of the fibres, maintains the upright stance of the fibre. Even under heavy use, the grass is able to spring back into shape. To make Royal Grass look as natural as possible, we continuously study natural grass. 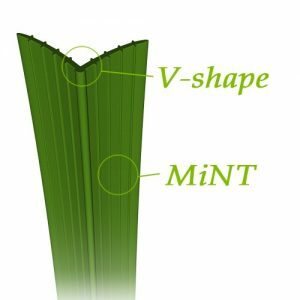 Since 2005, we are the first and only artificial grass manufacturer to produce the ‘V-shape’, inspired by nature. This is a lengthwise fold in each blade, just like real turf. Watch an animated video about royal grass here.